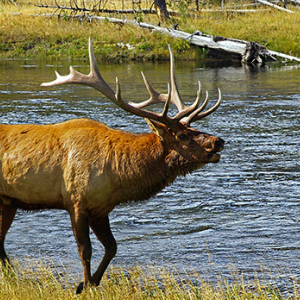 Bull elk bugling along the Madison River in Yellowstone National Park, Wyoming. Bull Moose,feeding in Cascade Canyon,in Grand Teton National Park, Wyoming. Bull elk feeding by the Madison River in Yellowstone National Park, Wyoming. Canadian Geese feding in the Snake River at Oxbow Bend during the fall in Grand Teton National Park, Wyoming. Deer fawn hiding in the brush on the trail to Amphitheater Lake in Grand Teton National Park, Wyoming.